In the field of telecommunications, fiber optic cabling is highly desirable for today’s communication. Since the physical fiber optic cabling is expensive to implement for each individual service, it is highly advisable to use a Wavelength Division Multiplexing (WDM) technology for expanding the capacity of the fiber to carry multiple client interfaces. Coarse WDM (CWDM) and Dense WDM (DWDM) are different wavelength patterns of WDM systems. WDM is a technology that combines multiple signals onto a single strand of fiber by using several wavelengths (frequencies) of light - each frequency carrying a different type of data. It is the technology enabling cost efficient upgrade of capacity in optical networks. In the family of WDM system, CWDM technology benefits from lower cost of optical components associated with a simpler technological concepts. Although limited in capacity and distance, CWDM is well suited to the needs of enterprise networks and metropolitan short distance. CWDM is a wavelength multiplexing technology for metro and regional networks. 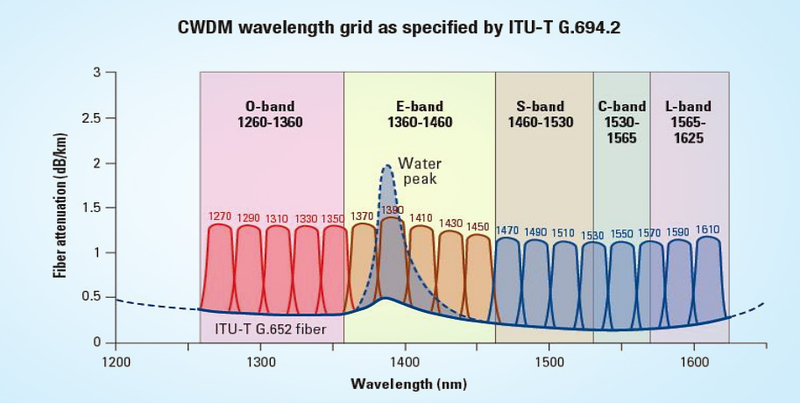 It was standardized by the ITU-T G.694.2 based on a grid or wavelength separation of 20 nm in the range of 1270-1610 nm, thus it is able to carry up to 18 CWDM wavelength over one pair of fiber. Each signal is assigned to a different wavelength of light. Each wavelength does not affect another wavelength, so the signals do not interfere. 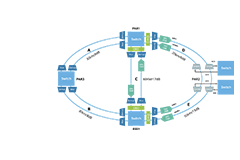 Each channel is usually transparent to the speed and type of data, so any mix of SAN, WAN, Voice and Video services can be transported simultaneously over a single fiber or fiber pair. CWDM is a cost-effective solution to provide a capacity boost in the access network. It can address traffic growth demands without overbuilding the infrastructure. 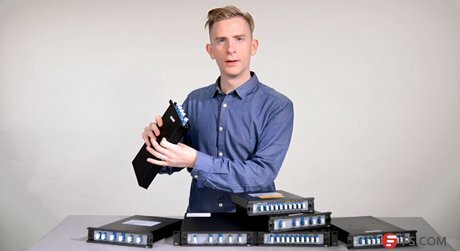 For example, a typical 8-channel CWDM system offers 8 times the amount of bandwidth that can be achieved using a SONET/SDH system for a given transmission line speed and using the same optical fibers. 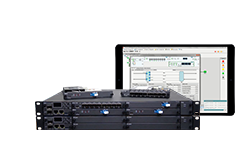 It is perfect alternative for carriers who are looking to increase the capacity of their installed optical network without replacing existing equipment with higher bit rate transmission equipment, and without installing new fibers. 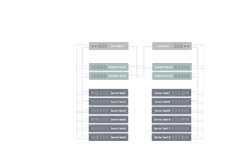 A Mux is commonly known as a multiplexer which combines multiple wavelength channels on a single fiber, and a Demux separates them again at the other end. A Mux/Demux set-up is especially useful to increase the end-to-end capacity of a deployed fiber. 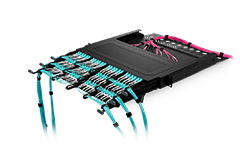 The Mux is typically located in the central office, and the Demux unit located in either a cabinet or splice closure from which point the fibers go to their destination in a star-shaped topology. Dual-fiber CWDM Mux Demux is a passive device multiplexing and demultiplexing the wavelengths for expanding network capacity, which must work in pairs for bidirectional transmission over dual fiber. It enables up to 18 channels for transmitting and receiving 18 kinds of signals, with the wavelengths from 1270 nm to 1610 nm. The CWDM transceiver inserted into the fiber optic Mux port should have the same wavelength as that of Mux port to finish the signal transmission. Single-fiber CWDM Mux Demux should be also used in pairs. One multiplexes the several signals, transmits them through a single fiber together, while another one at the opposite side of the fiber demultiplexes the integrated signals. 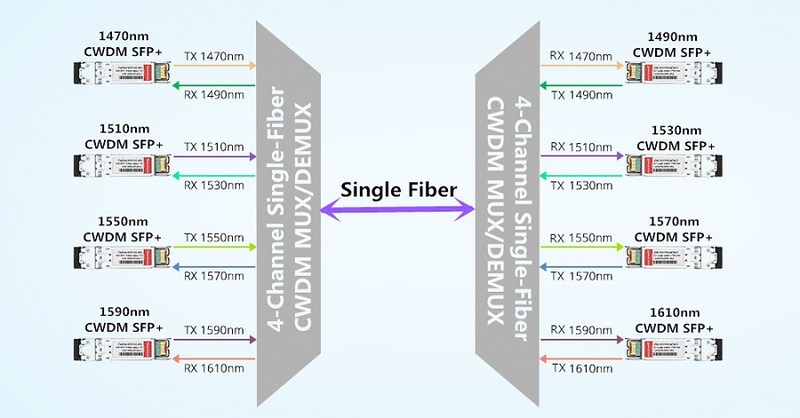 Considering that the single-fiber CWDM Mux Demux transmitting and receiving the integrated signals through the same fiber, the wavelengths for RX and TX of the same port on the single-fiber CWDM Mux Demux should be different. The working principle of single-fiber CWDM Mux Demux is more complicated, compared to the dual-fiber one. As shown in the figure below, the transmission from the left to right uses 1470 nm, 1510 nm, 1550 nm and 1590 nm to multiplex the signals, transmit them through the single fiber, and using the same four wavelengths to demultiplex the signals, while the opposite transmission carries signals with 1490 nm, 1530 nm, 1570 nm and 1610 nm over the same fiber. As for the wavelength of the transceiver, it should use the same wavelength as TX of the port on the CWDM Mux Demux. 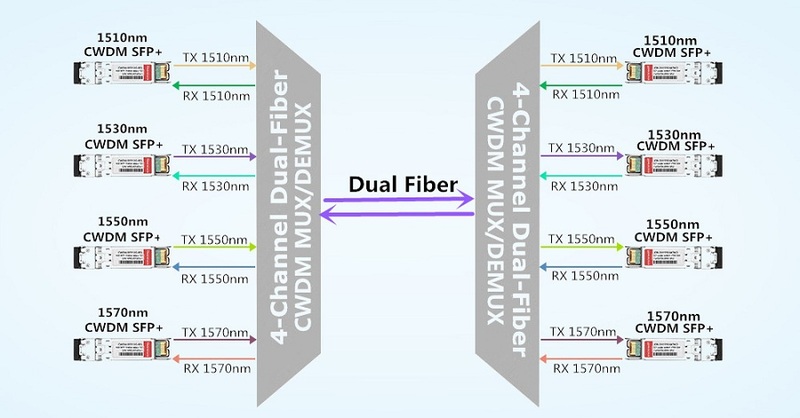 For example, when the port of a single-fiber CWDM Mux Demux has 1470 nm for TX and 1490 nm for RX, then a 1470nm CWDM transceiver should be inserted. Due to the technical characters of the CWDM, CWDM is applied primarily in the two broad areas: metro and access network. There are always two functions. One function is to use each optical channel to carry a distinct input signal at a individual rate. And another one is to use CWDM to break down a high-speed signal into slower components that can be transmitted more economically, such as some 10G transceivers. Metropolitan area network (MAN) refers to the network that covers the city and its suburbs, providing integrated transmission platform for metropolitan areas. 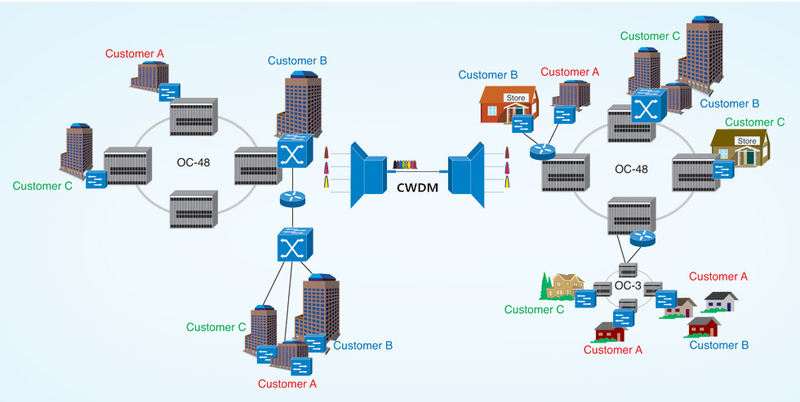 CWDM networks enable wavelength services to be provisioned over a large metro area, with the functional and economic benefits of full logical mesh connectivity, wavelength re-use and low end-end latency. These features are applicable to the Inter-Office (CO-CO) and Fiber to the Building (FTTB) segments of the metro network. The low latency benefits of CWDM are especially attractive in ESCON and FICON / Fibre Channel based SAN applications. The low space, power and cost benefits of CWDM also enable its deployment in the Outside Plant (OSP) or Remote Terminal (RT) segments of the metro market. CWDM has abundant network topology, such as point-to-point, ring, mesh, etc. The ring network can provide self-healing protection function: the style of restoring includes link breaking protection and node failure separation. CWDM rings and point-to-point links are well suited for interconnecting geographically dispersed LAN (local area network) and SAN (storage area network). Corporations can benefit from CWDM by integrating multiple Gigabit Ethernet, 10 Gigabit Ethernet and Fibre Channel links over a single optical fiber for point-to-point applications or for ring applications. With the benefits of low implementation cost, robustly, relative simplicity of installation and maintenance, Ethernet has been used popularly in the metro/access system now. As the bandwidth increases, higher data rate 10 Gigabit Ethernet was put forward. Ethernet integrating with CWDM is one of the best implementing methods. In one of 10 Gigabit Ethernet standards in the IEEE 802.3ae is a four-channel, 1300nm CWDM solution. However, if CWDM were based on 10 channels of 1 Gbps, then 200 nm of the wavelength spectrum would be used. Compared with TDM (transmission time division multiplexing), 10G CWDM technology may have a higher initial cost, but it can offer better scalability and flexibility than TDM. PON is a point-to-multipoint optical network that uses existing fiber. It is the economical way to deliver bandwidth to the last mile. Its cost savings come from using passive devices in the form of couplers and splitters, rather than higher-cost active electronics. 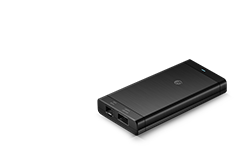 PON expands the number of endpoints and increases the capacity of the fiber. But PON is limited in the amount of bandwidth it can support. 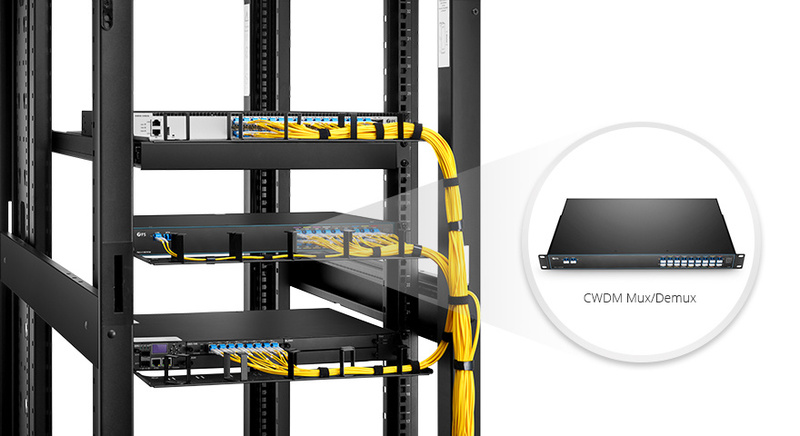 As CWDM can multiple the bandwidths cost-effectively, when combining them together, each additional lambda becomes a virtual point-to-point connection from a central office to an end user. If one end user in the original PON deployment grows to the point where he needs his own fiber, adding CWDM to the PON fiber creates a virtual fiber for that user. Once the traffic is switched to the assigned lambda, the bandwidth taken from the PON is now available for other end users. So the access system can maximize fiber efficiency. CWDM is able to transport up to 16 wavelengths with a channel spacing of 20 nm in the spectrum grid from 1270 nm to 1610 nm. 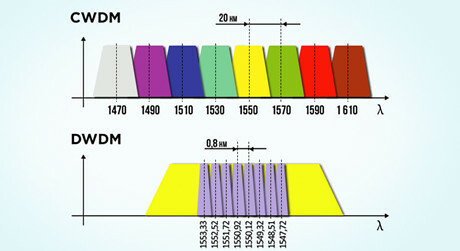 While DWDM can carry 40, 80 or up to 160 wavelengths with a narrower spacing of 0.8 nm, 0.4 nm or 0.2 nm from the wavelengths of 1525 nm to 1565 nm (C band) or 1570 nm to 1610 nm (L band). DWDM multiplexing system is capable of having a longer haul transmittal by keeping the wavelengths tightly packed. It can transmit more data over a larger run of cable with less interference than CWDM system. CWDM system cannot transmit data over long distance as the wavelengths are not amplified. Usually, CWDM can transmit data up to 100 miles (160 km). 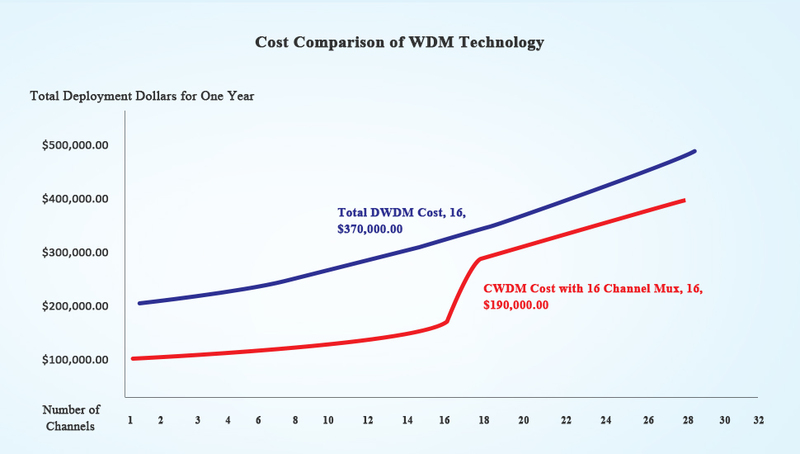 The DWDM price is typically four or five times higher than that of the CWDM counterparts. 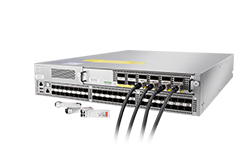 The higher cost of DWDM is attributed to the factors related to the lasers. The manufacturing wavelength tolerance of a DWDM laser die compared to a CWDM die is a key factor. Typical wavelength tolerances for DWDM lasers are on the order of ±0.1 nm, while tolerances for CWDM laser die are ±2-3 nm. Lower die yields also drive up the costs of DWDM lasers relative to CWDM lasers. Moreover, packaging DWDM laser die for temperature stabilization with a Peltier cooler and thermister in a butterfly package is more expensive than the uncooled CWDM coaxial laser packing. According to the Dell’Oro Group, the wavelength division multiplexer (WDM) market revenue is forecasted to reach $14 billion by 2021 driven by the demand for 100+ Gbps coherent wavelengths. 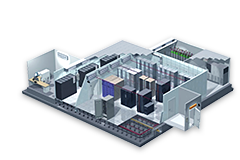 Enterprise direct purchasing for data center interconnect (DCI) will deeply influence the WDM market. DCI using WDM equipment is forecast to be a $2.4 B market by 2021. From these statistics, WDM equipment will have a good market in the near future. More recently, two new paradigmatic revolutions have made their way into the optical communication market: ROADM (Reconfigurable Optical Add-Drop Multiplexing) and Coherent Optical Systems. While these optical technologies are the perfect solutions to satisfy the growing demand for bandwidth, they also provide radical cost reduction in information transmission market. CWDM is an attractive solution for carriers who need to upgrade their networks to accommodate current or future traffic needs while minimizing the use of valuable fiber strands. CWDM’s ability to accommodate Ethernet on a single fiber enables converged circuit networks at the edge, and at high demand access sites. With traffic demands continuing to rise, the popularity of CWDM with carriers in the access and metro networks will be akin to the popularity of DWDM in the long haul and ultra-long haul networks. In the near future, CWDM continues to evolve into specialized applications. 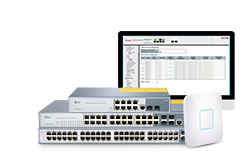 Combination transport and optical routers or switches are being developed now. Add-on CWDM cards are being included in more transport devices as low cost options. Suppliers are continuing to drive down costs and increase capacity.